So: Yes, we did it!! 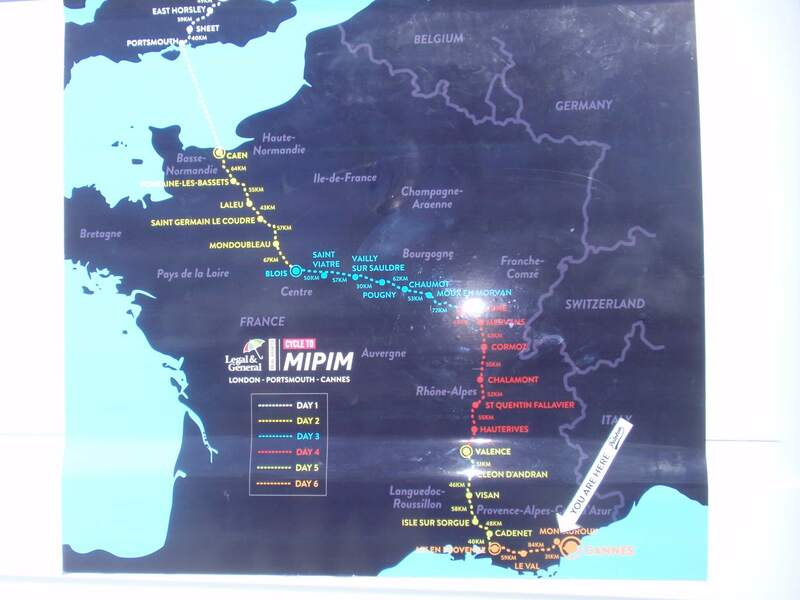 Andrew and I finished the MIPIM cycle to Cannes last week for the second time! A massive thank you to all our supporters and sponsors for what turned out to be a fairly gruelling six day ride, most of it accompanied by a strong head wind, with a few torrential rain storms thrown in. Here’s a summary of what happened over the six days, 1,500 kilometres of distance and 13,279 metres of climbing, with a few pictures and videos to help tell the tale. I have left out recounting the finer details of the comedy crashes (no-one got hurt, thankfully, but some riders still needed to master how to get their feet out of the peddle cleats…) applying chamois cream, saddle sore, chapped lips, propping your eyelids open with matchsticks, pain in the soles of your feet, never wanting to see another Mars bar or a banana ever again, as well as the names and faces of all the interesting, fun and outrageous people we both met on the ride. To sponsor Andrew and James please click here. Up at a 5.45 am with some last minute preparations and then on the bike at 6.30, my wife and two children waving goodbye as I braved the early morning cold to get myself to Central St Giles just off New Oxford Street for 7.30 am. Arriving at Central St Giles, there was already a large crowd of riders and support crew assembled so I quickly racked my bike, dumped my kit and dodged into registration to have my name ticked off. A few last minute adjustments, packing kit into various buses and coaches, I grabbed a quick coffee and croissant before it was time for our photo call (by now Andrew had arrived) with Stuart (our WS colleague) who took some photos of us in our sponsored kit. We also found the WS and Quinn Estates logos on our support bus and took a quick couple of photos of them for posterity. At 8.30 am we had the riders’ briefing and a few words of good luck from the current CEO of Coram, Carol Homden, and it was time to go. 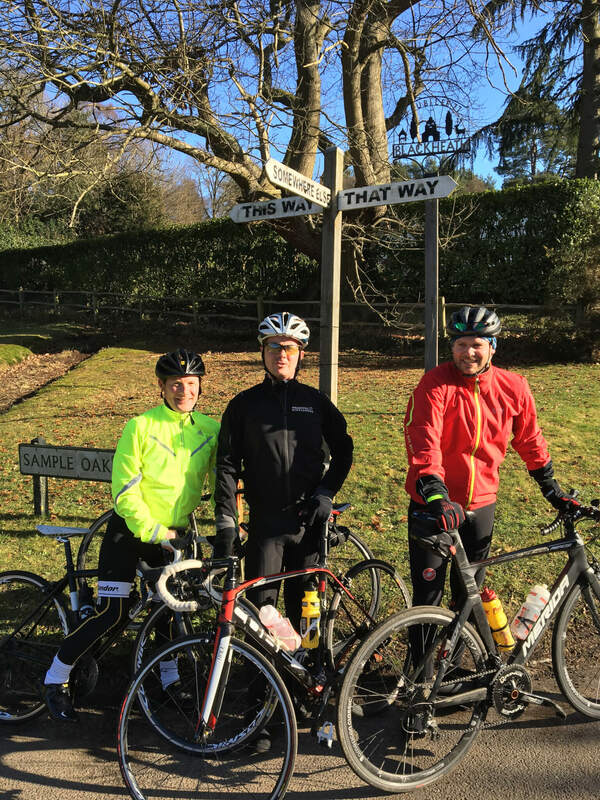 We would be setting off in our teams in five minute intervals (I was in a team sponsored by HTA, Andrew in one sponsored by Pitman Tozer) to make our way down from central London to Portsmouth – a total distance of 148 km. Slow progress through the streets of London, but the chat in the peloton flowed easily and everyone started to get to know those around them: where do you come from and what do you do. We made to our rendezvous point of a pub in Morden where coffee and crumpets awaited. Once all the Portsmouth teams had assembled at Morden we then set off for Portsmouth. The weather was very kind and we made it to East Horsley our lunch stop some 118 km later without issue. From lunch we pushed on to Portsmouth itself and arrived after dark although you could smell the salty air. We had a meet-point at the Queens Hotel where we were allowed to grab a shower, change out of Lycra into civvies and have some food before boarding the ferry for the night. Buoyed by the first day’s experience, most people seemed to get stuck into the beer although I managed only a large glass of coke and a mountainous helping of pasta and salad (Andrew had beer!). Not enough time for the food to even to go down, we left the hotel to take the bus to the port and board a ferry for the overnight crossing to Caen. I was pleasantly surprised by our two bed cabin (I shared with Andrew) which was to my great surprise above the water line, although opposite one of the car decks (every time the ship rolled slightly in the waves, various car alarms would go off). Straight to bed for what we knew would be an early start. Lights out – Day 1 done. Oddly the sound of harpsichord music playing through the cabin speakers woke us at 5.30 am so that we were ready for breakfast at 6. Shovelling down bacon, eggs, bread, a croissant, orange juice and really awful coffee, this was where the cycling really started. Once we had disembarked, we were taken to the bicycle rendezvous point to begin the first leg of our 268 km stint for that day. For some strange reason I found myself at the back of the 90 strong peloton for most of the day which is a fairly tough place to be as, as any cyclist will know, when you cycle in a long peloton, any motions of breaking or accelerating at the front of the peloton are exaggerated at the back of the group, meaning that at the back you are constantly having to break and then catch up with the rider in front. Despite that, I felt pretty good all day and the weather was again very kind – quite cold but clear or at worst overcast, but no rain – and I found myself only slightly irritated by pain in my shoulders. We passed though some lovely picturesque French villages during the day and some fairly idyllic countryside. Our penultimate stop was in a beautiful French hilltop town of Mondonbleau, as the sun was going down. I felt good and was keen for the last stage of the day – a night ride into the town of Blois, mostly downhill. For the day we were slightly behind schedule so we arrived in Blois at about 10 pm. It was then a case of shedding the bike and the Lycra, finding your room and then getting to dinner to feed yourself ready for what would probably be about four hours sleep. Chicken, pasta, boiled eggs and more pasta followed by a very nice Tarte Tatin saw me repleat before I shuffled off to bed. The buzzer went off and I am not sure I had a wink of sleep in anticipation of having to get up so early. Still, I dragged myself out of bed, Andrew did likewise we donned our respective cycling gear before heading off down to shovel yet more food. Eggs, bacon, cheese, ham, bread, coffee – definitely lots of coffee – plus a banana. I had forgotten how much you need to eat in order to keep cycling for six days constantly. Already the stomach and metabolism appeared to have acclimatised. Today was to be our longest day – 324 km – but the weather we looking ok albeit that there was a strong south easterly wind blowing against us all day. The route was mostly flat but hard work given the ever present wind in our faces. By Stage 4 (some 199 km into the day) I was feeling the full force of the lack of sleep, cumulative mileage and head wind that I decided to take stage 4 (a mere 53 km stage) off and retired to the support bus to sit this stage out. Being so tired, I fell asleep mid-conversation with another rider and was jolted awake when the bus reached the final stage rendezvous point. As we waited for the cyclists to arrive, those not riding the previous stage got stuck into a selection of really lovely cakes that had been purchased especially for the riders. This being Saturday afternoon, England were playing France at rugby and a number of riders decided to try and find a bar in which to watch the sporting spectacle. I am not sure whether they managed to find one although given the result perhaps missing out on watching it was the best thing. The riders arrived and whilst they gorged themselves on cake and coffee, I prepared to take on the final stage of the day. However, I could not seem to shake the tiredness from my limbs and so, being so exhausted and it being a night stage decent down into the town of Beaune, I decided also to give the last stage a miss and hopefully get to the hotel ahead of time so that I could make my arrangements for the following day and perhaps get more than the customary four hours sleep that night. Missing the last stage from the day before proved very useful, as the first stage on Day 4 was to prove very trying. Again, we woke up at 5 am and stuffed our faces with breakfast (there is a theme emerging here…!) – a couple of mini-croissants, some ham, cheese, yoghurt, a banana and again lots of coffee – the usual fodder. The forecast was that the rain would come down for 6 am and for once the weather forecast was accurate – by 6 am the heavens had truly opened, with the temperature at only 2 to 3 degrees-C. Within minutes most people were soaked to the skin and so it continued for the remainder of that stage ride which I spent peering out through my rain and mud spattered spectacles as a thousand red lights in front of me, hoping not to crash into anyone and/or hit any potholes, simply praying for the dawn to break. An hour and a half later and daylight (no sun) had broken enough to be able to see at least the road surface clearly, although the rain had not abated. Two and a bit hours after departure, we finally reached the first stop, most of us (including both Andrew and I) shivering in our skins and desperately needing a change of clothes. I, like numerous others, decided to do exactly that in the comfort of the support bus over the following stage which allowed my body to warm up just enough to enable me to contemplate getting back on the bicycle. The rain continued to shower us on and off for most of day, sometimes lightly, at other times in true flash flood style. However, towards the end of the day the sun did threaten to shine through the clouds and warm numb fingers and toes. The final stop of the day (before our hotel) was in Hauterives, a beautiful riverside town, where the rider support crew had organised the delivery of about 30 fresh pizzas for the riders, who feasted ravenously on classic margarita or ham and mushroom. We were warned by the race director not to eat to much as the last stage of the day involved a serious hill climb right out of the stop – but as far as I remember, no one paid him any attention, myself included! Buoyed by taking on board Italian dough and various toppings, most people headed out for the last stage of the day, 48 km into the town of Vallence. The last stage was a beautiful ride, albeit most of it in the dark, simply because it consisted of grinding uphill for about 6 km at the beginning of the stage but then reaping the benefit of a 42 km downhill on the far side into the town of Vallence at break neck speed. Hugely exciting albeit somewhat dangerous! Last day of having to get up at 5 am! Today we would meet up with the Folkestone riders (all 100 of them) at lunchtime where upon we would all ride into Cannes together. Only 148 km for the day, however, some serious climbing (another 2,342 metres assent in total) but for every uphill there is a downhill – some of them very fast. The sun was shining and the temperature soared to a heady 16 degrees Celsius and the sun cream made a welcome albeit belated appearance. 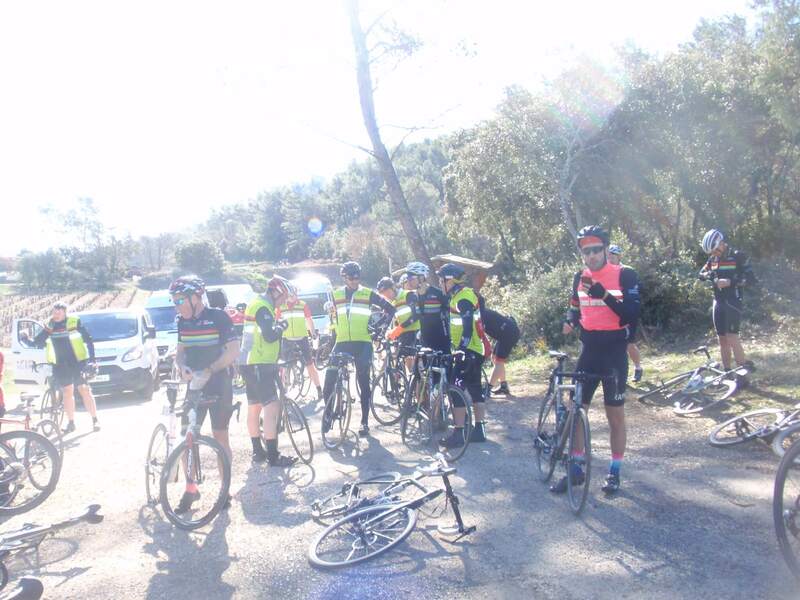 Our last stint of 30 km was quite slow as we progressed into Cannes with all of the 190 riders in their various teams processing along the Cannes front into the Marina area where we were greeted by the ride organisers and certain other invited guests to much clapping and cheering. We had made it, and no more cycling for at least a week…! 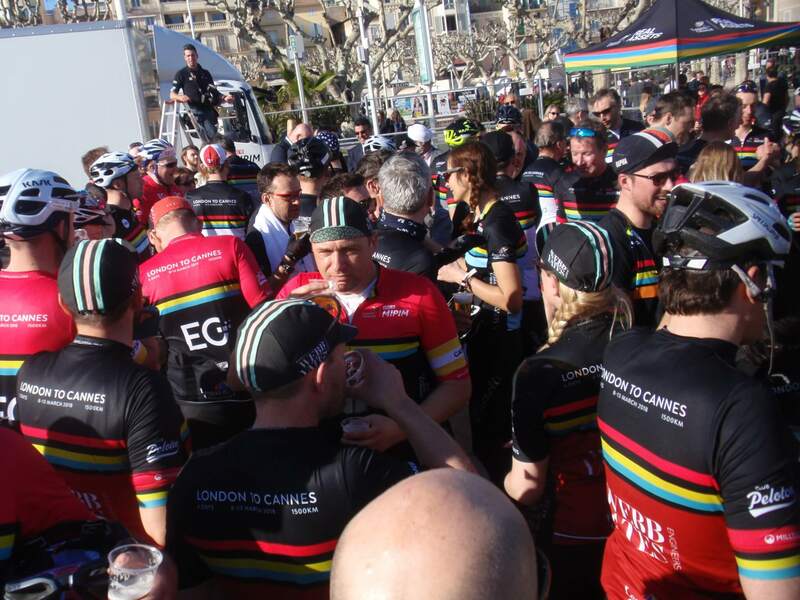 Much hugging, high-fiving and uttering of the words “Well done” followed, before we were invited in to the marquee for a well-earned beer (which tasted so good…) and a burger and fries (all pro-cyclists swear by them….). Group photo (all 190 of us) and then more beer and commemorative medals! As people started to filter out to find their accommodation or go to their various MIPIM meetings or dinners, I reflected that yet again, the ride had been fantastic fun and a superb opportunity to get to know lots of people from different property backgrounds, all in the name of raising money for Coram, an incredibly worthwhile charity. So thank you again to all our sponsors and supporters for helping us with the ride and allowing us to edge ever nearer to our fundraising total – with luck as a whole group, we will break the £750,000 mark which will be the biggest fundraising effort in Coram’s history. Day 4. 5.00am alarm call. Shove breakfast down and on road by 6.00am. Very, very wet….torrential in fact. Not a nice experience but only 42k. Coffee and a croissant awaited at the rest stop. Got through that. Now onto Stage 2 for the day. Did stage 3 (35 miles) and just got in before the heavens opened. I was asked if I was doing the next stage – I said not if it’s raining. It was and l am in the bus! Jim is on the road – and since he left it has bucketed it down – I am sitting very happy on my decision! This is a real war of attrition. Not only have we had very wet stages at the beginning of each day which has kept our clothes damp all day, but we have been battling a vigourous head wind all the way which is batting us back. 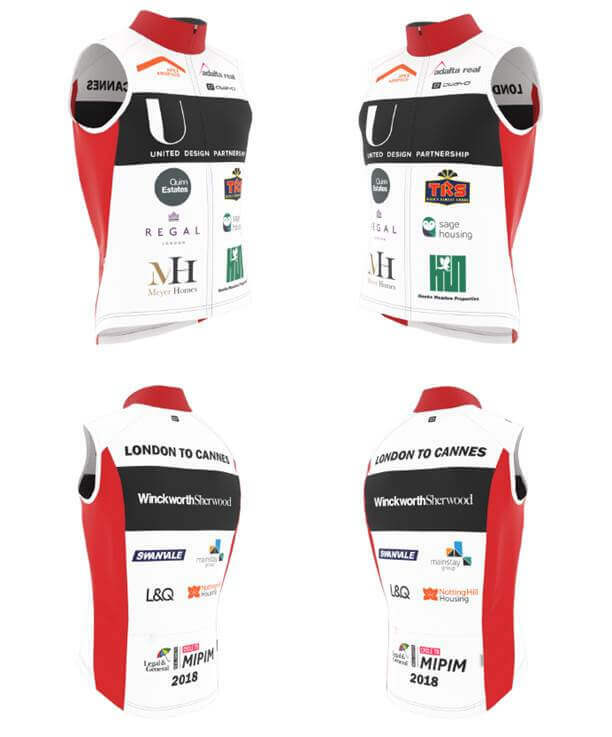 With the MIPIM ride now just over two weeks away, (with two weekends left for last minute training!) all the worries and flashbacks to last year’s toil and strife are now starting to reappear! 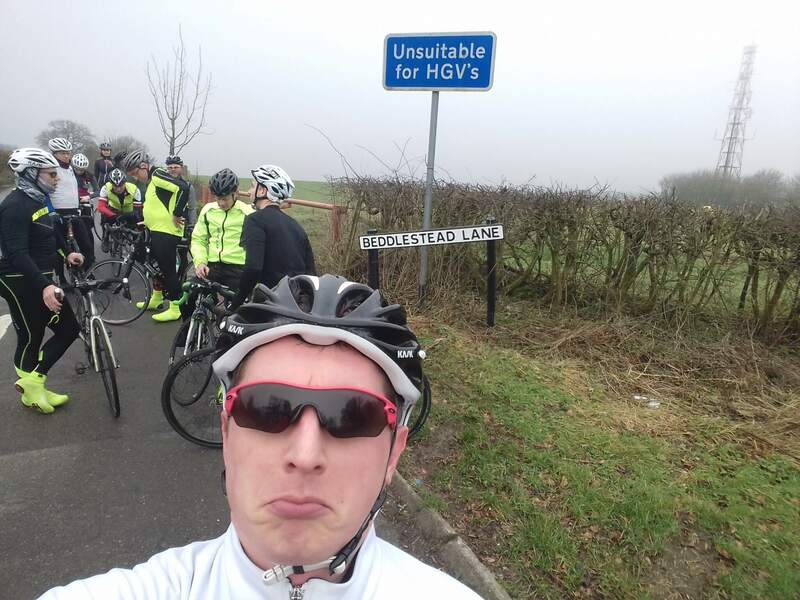 I managed 100 miles last week – just! With the help and assistance of Dougal Hartley (Asda) Ben Littman (Hammerson) and Graham Wilson (McDonalds). Dougal and Ben are themselves training for a hike up the Italian Alps and Graham for an Iron Man in the summer. 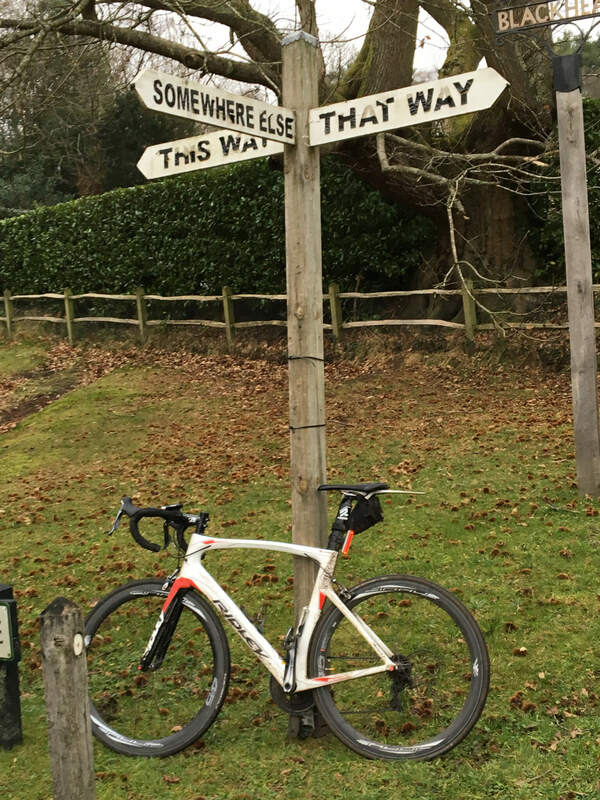 They joined me for a very pleasant 45 mile ride round West Surrey, starting and finishing at the Black Swan in Ockham, and passing the now familiar sign at Blackheath (see below). We haven’t had many great weekends weather-wise this year, but last Saturday was a picture and most enjoyable. Let’s hope it continues. In view of Jim’s numerous training updates, I thought I ought to contribute to this blog as well! As for my training, I somehow managed 300 ‘alcohol fuelled’ miles in December but bad weather and a ski trip took its toll in January, where I could only muster 265 miles. So I am very much in the ‘last chance saloon’ to try and get some mileage under my belt over the next 3 weeks. 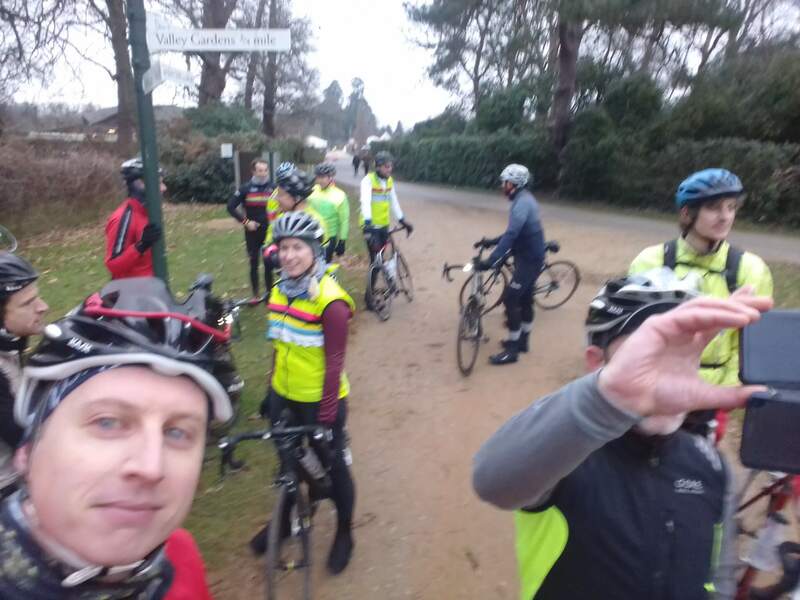 This all started last weekend, commencing with the Club Peloton organised ride around Sevenoaks (65 Miles) on the Saturday. A chilly ride, but I managed 45 miles in a temperature of 1 degree, completely soaked, cold and it was quite unpleasant. 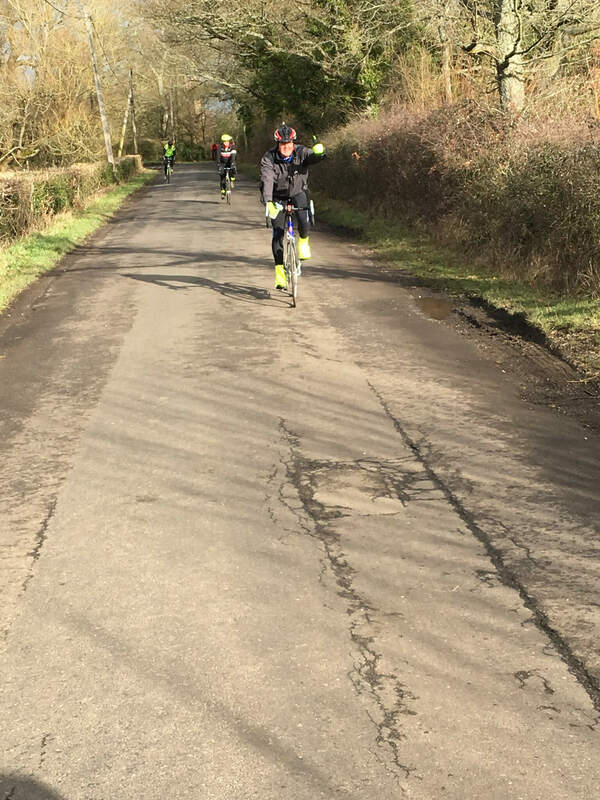 Andrew and I both signed up for this one – a fully supported Club Peloton ride around the north Kent towns of Sevenoaks, Westerham and Edenbridge. Confronted with the bitter cold at 6.15 a.m, I made my way to Oxsted by train for a 7 am rendezvous at the Grasshopper Inn. As expected, there were a number of other cyclists on the train down to Oxsted and we all joined forces to get ourselves along the busy road from the station to the meet point. 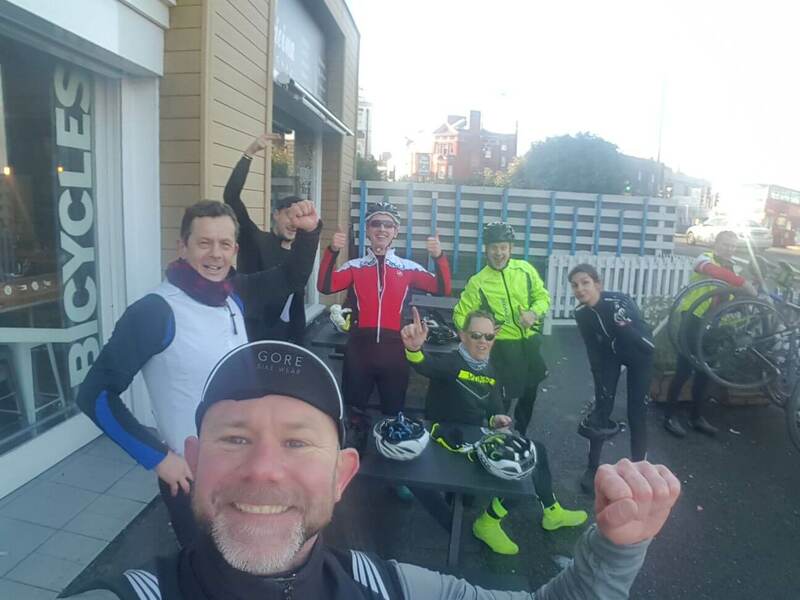 Bacon rolls and coffee beckoned together with saying hellos to a good number of people who I already knew through rides of this type – saw Andrew engaged in chat with a couple of the Vectos chaps, Mike and Anthony – before we were ushered outside into the cold to start the ride. The great thing about the Club Peloton rides is that everything is provided for – food and drink, a ride captain to ensure you don’t get lost, mechanics who will fix your puncture by swapping your wheel out, Tour de France style – and the fact that they really research their routes and put together really interesting rides. 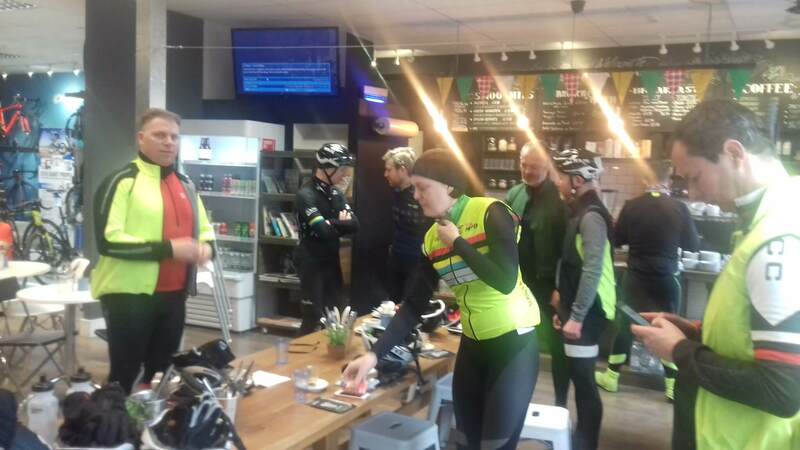 The weather was dry but really quite cold, with a fairly strong wind – thick gloves and balaclavas were plentiful, together with cyclists’ usual cold weather complaint of dripping noses. The route itself was a very good mixture of flat and bumpy terrain – the first hill caught me by surprise – I was in the wrong gear and couldn’t afford to change down because doing so would have meant that I would have had to stop, so I had to really pump the legs to get up in a high gear. It did at least warm me up considerably. After a brief stop for coffee, we took on Toys Hill, which I have done many times but it never fails to surprise me how it seems to go on and on at a steeper and steeper angle. I made it up in good time, although no polka dot jersey for me! Made it back to the Grasshopper Inn after a nice round trip of some 70 odd miles, a very nice chilli con carne awaited for lunch, after which I made my excuses and got back on the bike to go home – conference call at 5 pm, couldn’t be missed. See photos from the ride here. 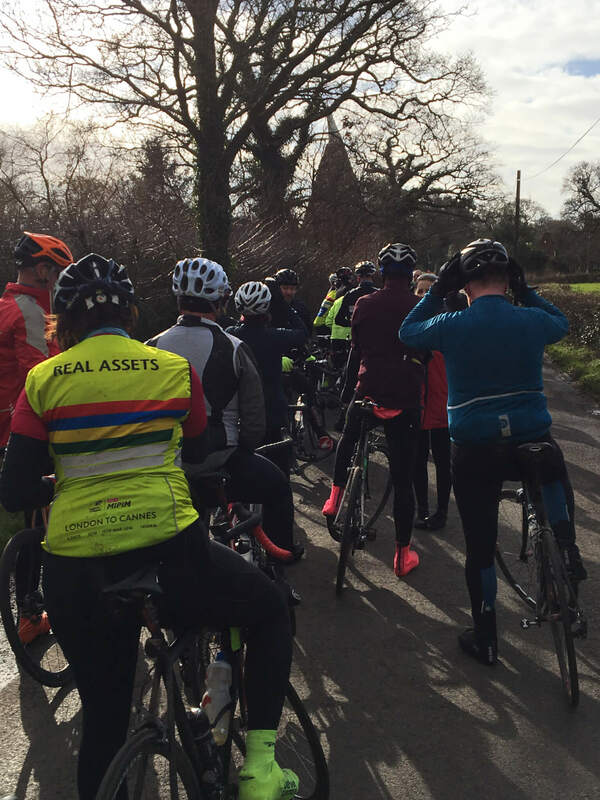 This was a monthly ride organised by John Forbes, a well-known property finance expert and extreme/endurance cyclist. At a very civilised hour (9 am) I started to make my way to Crystal Palace for the 9.45 am rendezvous at Cadence Cycling Shop and Café. There were a couple of people I had already met on previous rides plus a few that I hadn’t. Introductions and a quick double espresso later, John appeared with a number of other riders who had come from London Bridge. Quick gear check and we were off down Crystal Palace hill, making our way through West Wickham towards north Kent. The weather was quite cold and overcast but not bad in cycling terms. Having done this particular route a number of times before, I found myself at the front of the group with John and we talked about a couple of his cycling escapades, notably the fact that he was currently the Cheshire Endurance Cycling Champion – 240 miles+ in 12 hours over lumpy terrain. We made our way to Westerham, Brastead and other picturesque Kent towns whose names escape me. We took on the lengthy Toys Hill on this occasion (not the dreaded York Hill) plus a few other little surprises that John had up his sleeve! The ride was at a good speed and definitely got the blood pumping. 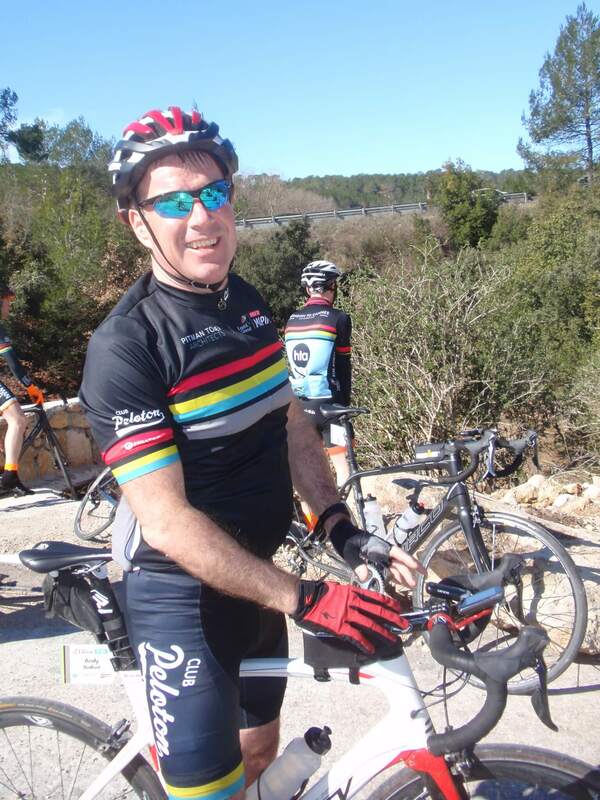 Only one mechanical malfunction – my chain came off on a particularly steep incline – wasn’t easy to get restarted! A round trip of 50 miles, we made it back to Crystal Palace and it hadn’t rained – surprisingly on this occasion I made to get up Crystal Palace hill in double quick time – clearly the training is working its magic. Bring on MIPIM! Back to Cadence Café for a well-earned lunch courtesy of Mr Forbes – thank you! For the property geeks amongst you, see if you recognise anyone in the photos below. 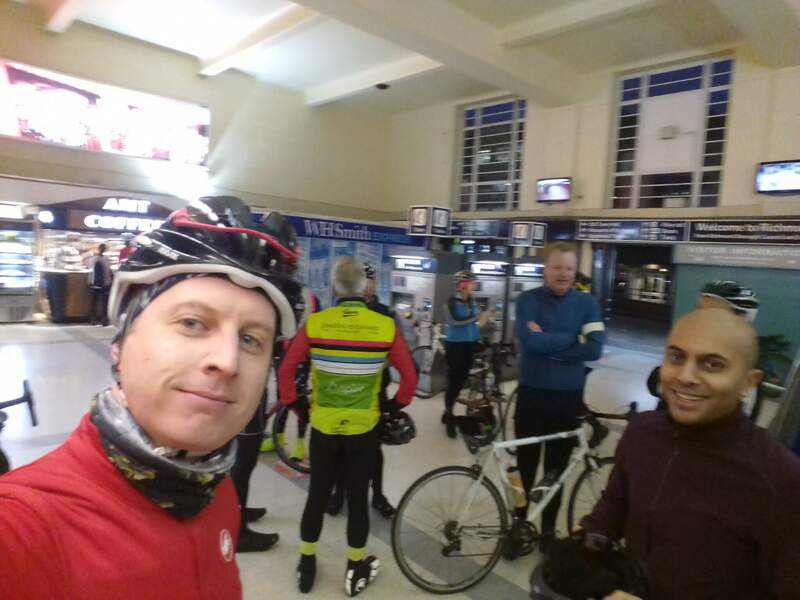 Training ride out towards Maidenhead with about 40 other riders starting at Richmond station at 7.30 on a very dark morning – apart from the very grey sky, the weather was fine: no rain and not particularly cold. This was to be a 90 mile jaunt through the Thames Valley, out to Windsor, Slough, Reading, Maidenhead and Henley (possibly not in that order!) 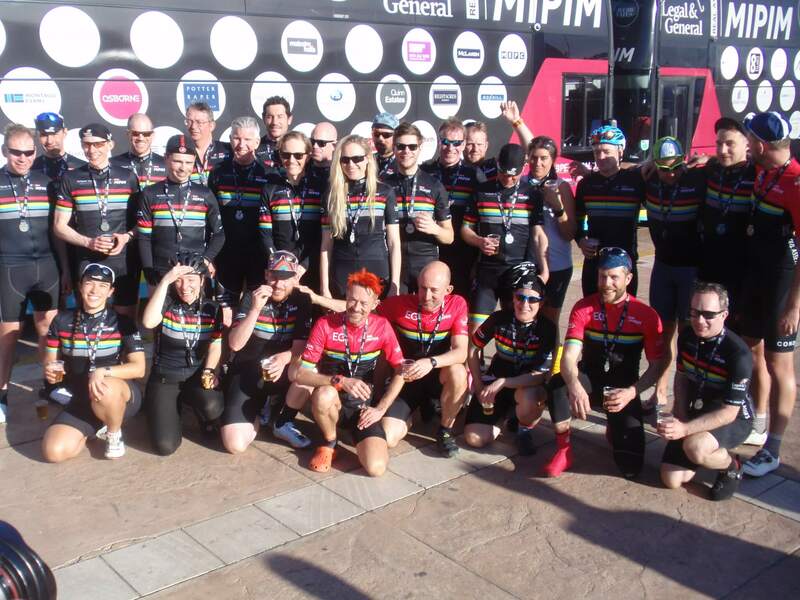 Lots of new faces on the ride, many of them doing the MIPIM ride this March, so great to meet some fellow riders. The route was very flat, so very accommodating to all levels. First stop was the Obelisk in Windsor Great Park, where we told to cycle slowly for fear of getting into trouble with the park’s Wardens! Sadly the coffee van was not open, so we would have to go hungry/thirsty until about 60 miles. Some lovely countryside was passed before we reached our lunch stop – a café called Velolife in Warren Row, clearly a bit of a cycling Mecca – very well kitted out to take care of cyclists and I heartily recommend it. One delicious “ham-n-cheese” toasty later (Miguel Induran swore by them) and we were back on the road for the remaining thirty miles. However, not long later I suffered a mechanical malfunction – one half of my right shoe cleat tore away meaning that I could do nothing other catch the train home – from Wargrave, which is on a branch line from Twyford. Three trains later, I was back in London, looking for a branch of Evans so I could buy a new shoe cleat to get back home. Unfortunate end to what was a great ride, but at least I got 60 miles under my belt. Early(ish!) 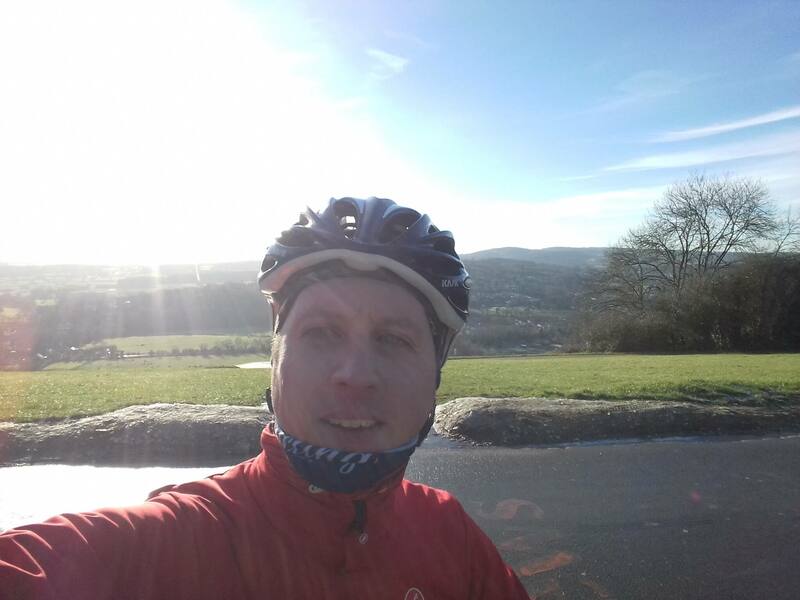 solo training ride out to Box Hill and back on Saturday morning – just me, the bike and the frost! Surviving a few slippery corners on the way out to Carshalton, where the duck pond was completely frozen, I headed towards Epsom Downs, following a well-worn route known to many cyclists. On this particular morning, I found myself very alone on the road. Despite being cold and frosty, the sky was clear and blue, and the sun was shining; and I could still feel all my fingers and toes. From Epsom Downs on to Reigate and from Reigate on to Dorking. When in Dorking, got to take on Box Hill, which ordinarily holds no fear, but on this morning because of the frost, the trek up the hill was actually quite terrifying, as the cars passing on both sides kept sliding on the ice – only one near miss and I made it to the top for a cup of coffee in the deserted café. Quick photo at the view point for posterity and the then back home through Leatherhead, Ashtead, Oxshott, Esher, Surbiton and Kingston – 49.3miles in total – if I’d known before I stopped, I would have cycled around the block a couple of times to get to 50! Proposed training ride to from Box Hill to Brighton and back, with Andrew Bedford leading the charge. However, decent snowfall and icy, windy conditions put paid to the whole event. Better luck next weekend. 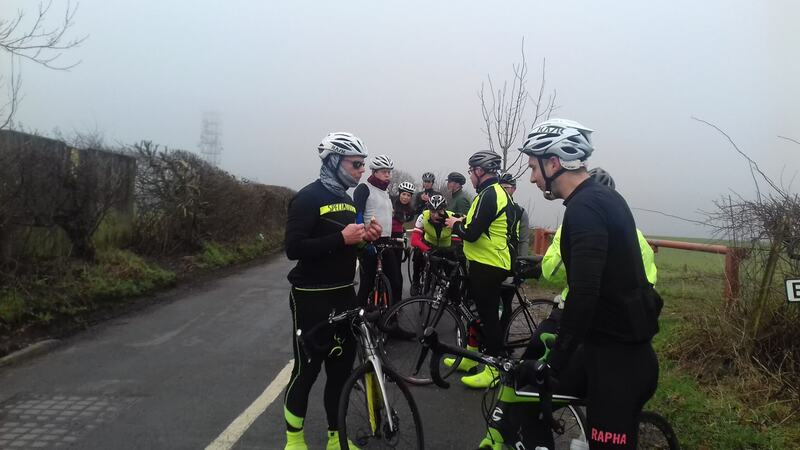 Training ride in the Ashdown Forest, Kent with Club Peloton. Up at 5 am to get the 5.54am (!) train to Hever in Kent for a 50 mile canter around the Kent countryside. The start of the day was not promising with severe cloud coverage and rain imminent. 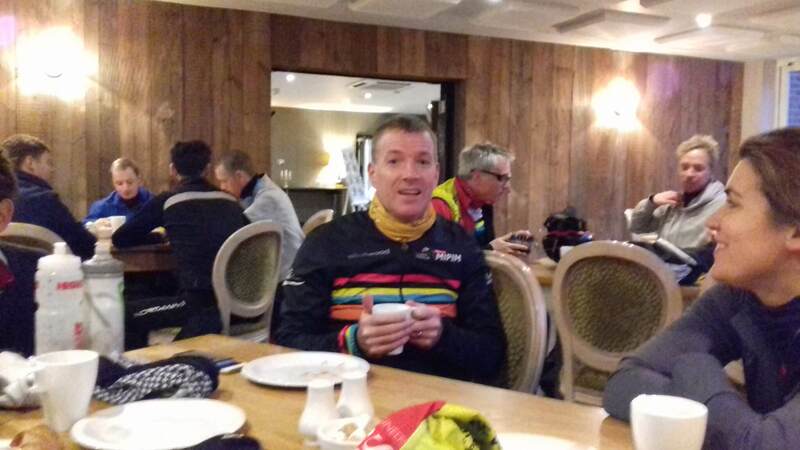 However, a pre-cycle breakfast of bacon rolls and coffee at the meet point of the Hever Hotel with the 30 or so other riders were well received. Andy Bedford clearly enjoyed his – see pic! The ride was a slow-ish one, designed to suit all comers, but just what we needed to ease us back into the saddle; and through some lovely scenery. One (almost) lung busting hill climb and a fast descent later, the clouds disbursed and the sun came out to make for a bright, if cold, day where the 50 miles disappeared beneath our wheels with relative ease. 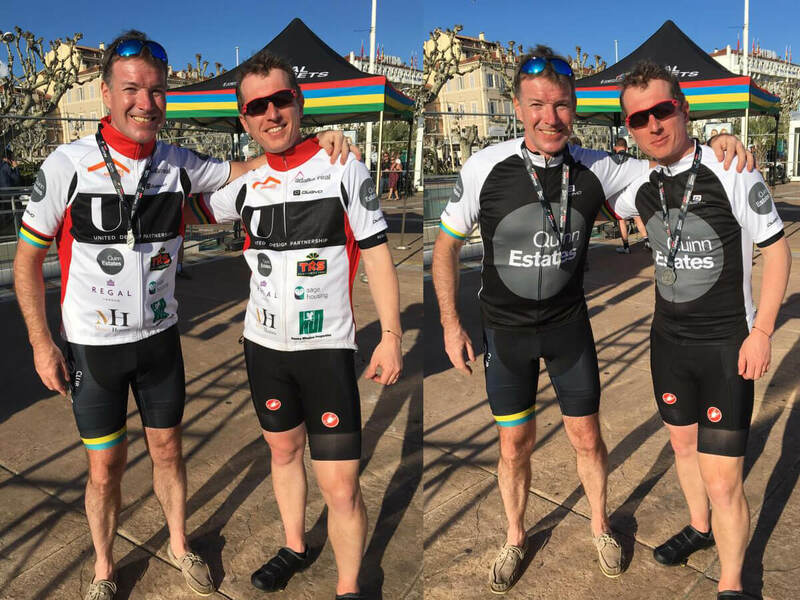 We saw some old faces met some new ones, some themselves doing the MIPIM Ride in 2018 and others not. 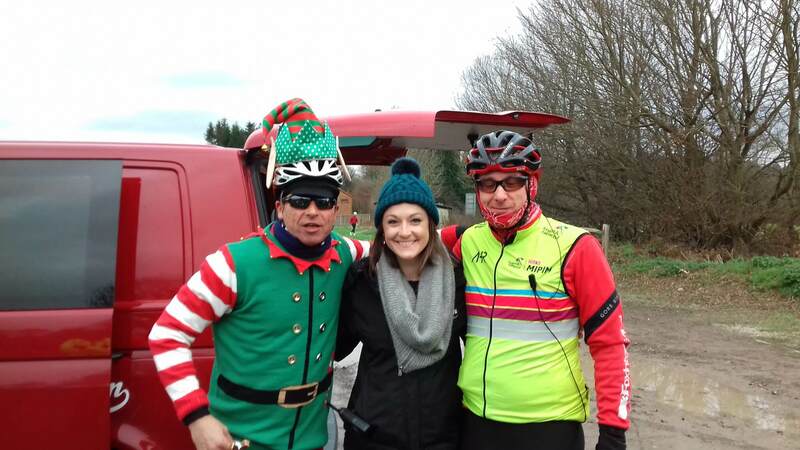 The social highlight of the day was being in the company all day of one of Santa’s elves – photo to prove it – you should have seen his ears flap in the wind! He was clearly working on an alternative for when Santa’s sleigh breaks down. A successful ride for all involved and as ever, really good fun. The only down side was that Southern Railways decided to cancel all trains running out of Hever Station back to London – for those of us without a car, it was another 15 mile cycle to the nearest train station where trains were running – still, all good exercise! View Parents evening: who attends during divorce and going forward?